I posted about a month ago that I was considering selling barbecue plates for Labor Day Weekend at this local "biker ralley". Well, after much back and forth, I've decided to give it a go. Having NO IDEA about the number of plates we're going to sell, I've decided to cook some of the butts in advance (then pull, vacuum seal, and freeze). I've had good success with doing a fast cook (350-375 dome) for 4-5 hours. However, the meat isn't quite as tender and since it doesn't spend much time during the plateau period, the fat doesn't break down like a low and slow. I'd rather do low and slow. 2. Am I going to run out of lump? 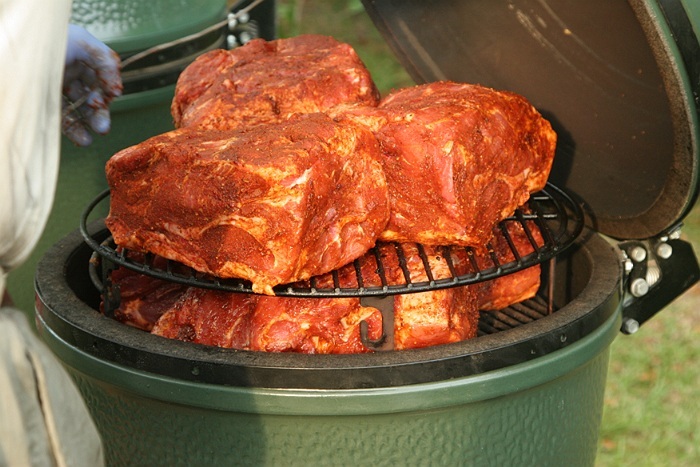 I've always had a lot left when doing butts before (of course I fill it up almost to the top of the fire ring). I will likely wind up doing 4 or 5 the normal way, but I'm always wanting to try something new. Anyone else tried this? Six is a stretch and as I said before DO NOT attempt this without the aid of a BBQ Guru or a Stoker. Without them you'll be up all night tending to the fire. did you remove the fire ring on that set up? No.. That is with tjv adjustable rig. When the 6 were done the 1/2 steam pan under them was full. 8 is too much of stretch. With the 6 I had little room for air flow. Which I say don't attempt it without some kind of forced air control. Better off with two eggs. You can bet it used up the fuel too. I'll stick with 4 or 5....6 if I'm feeling frisky. I'll be doing this first run in the morning, so I can watch it during the day. If I can get 5 done tomorrow, I'll need to give the egg time to cool down so I can load it up Thursday morning. I can start the next 5 on my large and 5 on my parent's large on Thursday afternoon. The picture was one of 3 eggs equally loaded. 18 total, but each of my eggs had a DigiQ II on them.. Even then one of them needed to be reloaded in the middle of the night. Don't turn your back on the egg too long if you don't have a Guru or Stoker. If you are going to sauce the pulled pork you will find that the butts go a long way. One year we did some butts in a sunbeam roaster and pulled them added BBQ sauce and sold 100's of sandwiches. We just added more sauce and water as the day wore on. Pulled pork will soak up lots of sauce. 6 on large ...impressive. I haven't attempted more than 4.